Peluso Microphone Labs is a sponsor of the Floyd Radio Show. The Floyd Radio Show is produced exclusively with Peluso microphones to capture the high quality performances on the show. The Floyd Country Store is a Peluso Microphone Lab dealer and has a great selection for the musician or the studio alike. 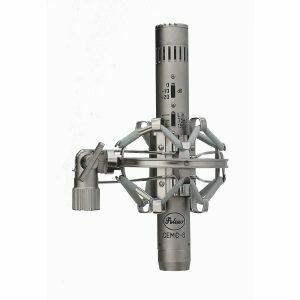 Peluso Microphone Labs is a family owned and operated business in Floyd, VA. Peluso microphones are hand assembled using the highest quality modern and vintage components sourced from around the world. Do yourself a favor and go check them out at their website. These products are available at the store and cannot be purchased through our online shop. The Peluso 22 47 SE is a large diaphragm condenser microphone styled after the legendary “Neumann U-47”. To achieve the distinctive “47” sound we have found the 6SJ7 American style steel tube provides the same sonic quality as the VF14. With nearly identical specifications, the only discernable difference between these two tubes is a 2dB quieter noise floor on the 5693/6SJ7. These tubes are thoroughly tested and fully covered by our 3-year warranty. This American style tube is readily available and allows us to offer the Peluso 22 47 Standard Edition at a very competitive price. Professional engineers enjoy great success with the 22 47 SE for a wide range of applications from male and female vocals, acoustic guitar to tenor sax. There are countless applications for this versatile microphone. Known for its clear sound while capturing the low frequency nuances of the original U-47 with smooth mid range and balanced high end. Engineers will be proud to have a hand built microphone with the sound of a genuine U-47. The 22 47 SE is paired with the Peluso MX-56 power supply. The dual sided capsule in the 22 47 SE enable the power supply to feature 9 polar patterns in an array from omni-directional to cardioid to figure eight. The 22 47 SE features our heavy-duty 8-pin screw on cable connector. The large diameter pins in the screw on connector give a tight and secure cable connection designed to perform for a lifetime of use. Microphone kit comes as a complete system including: 22 47 SE Microphone in a Wood Box, Power Supply, New-style 8-Pin Screw on Cable Assembly, and a Shock Mount all packed in a Flight Case. The Peluso P-84 is a small diaphragm 48v phantom powered microphone with an exceptionally flat frequency response curve. With its transformer output and excellent cardioid pattern characteristics across the full frequency spectrum, our P-84 is remarkably authentic to its long discontinued inspiration, the Neumann KM-84. Improved in low frequency responsiveness and high sound pressure level capacity the P-84 is one of our most significant achievements yet. Microphone kit comes as a complete system including: Two P-84 Microphones in Wood Boxes, Two Omni and Two Cardioid Capsules with the Extra Capsules in a Wood Box, Two Shock Mounts, Two Hard Mounts, and a Stereo Mounting Bar, all packed in a Flight Case.